I have a wonderful tasty treat for your puppy and dog! 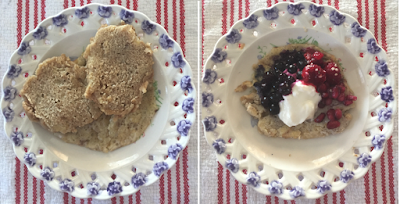 Pancake and waffle recipes made with species appropriate ingredients! Conventional pancakes and waffles aren't good for dogs or a puppies. You can eat them too! ½ tbs organic cold pressed unrefined coconut oil; or pastured organic unsalted butter. Optional ingredient, ½ tsp organic Ceylon cinnamon powder. Heat the pan or skillet. Place coconut oil or butter in skillet, fry pan and heat. When the coconut oil or butter sizzles the pan is ready for pancake batter. Crack eggs, drop white and yolk into your mixing bowl. Whisk egg whites and yolks together. Tip - you can use the eggshells to make eggshell powder. Mash the banana, combine with whisked eggs, mix well. Optional ingredient, add the Ceylon cinnamon powder. Use a large spoon to drop the batter onto the heated pan or skillet. Cook the pancake for at least one minute then flip to allow the other side to cook for another minute. Allow the pancake to cool. See suggested toppings further below. Store pancakes in the refrigerator for up to 3-days. Or place in the freezer. Recipe makes 2 large, 4 medium or 8 small pancakes. Optional ingredient ½ tsp organic Ceylon cinnamon powder. Add 1 tbs of green banana flour, and 1 tbs of coconut flour. Add the Ceylon cinnamon powder. 2 tbs green banana flour, organic, 100% pure. 2 tbs coconut flour, organic, 100% pure. Optional ingredient ½ tsp organic Ceylon cinnamon powder . Plug the waffle maker in to heat-up. Crack the eggs, drop white and yolk into your mixing bowl. Add the green banana flour and coconut flour. Use a large spoon to drop the batter onto the heated waffle maker. When ready, remove the waffle from heat. Allow the waffle to cool. You can store waffles in the refrigerator for up to 3-days. Recipe makes 2 large, 4 medium or 8 small waffles. 1 tsp pure honey raw 100% natural, unpasteurized (not for puppies under 12-months of age). 1/2 tsp raw organic pumpkin seeds. 1 tbs kefir (fermented milk) or yogurt; plain, organic. Few large flakes of organic coconut meat. Berries, fresh or frozen-thawed blueberries, raspberries etc. Pomegranate seeds, fresh or frozen-thawed. If your kitten or cat likes these pancake or waffles, she can have some too! 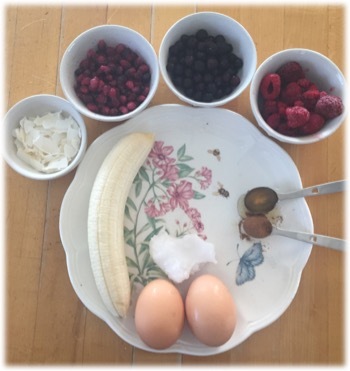 Organic bananas and pastured eggs are the ultimate choice. Next best, organic free-range eggs.